Extended Vendor UI extends the vendor interface, increasing the number of items visible per page, making it a little easier to find the items you're looking for. It also adds search and filtering functionality, and a button to quickly vendor all unwanted junk items. - Width of the vendor interface (and number of items visible per page) doubled. - Item names on both merchant and buyback tabs are colored according to the item's quality. - Search box to quickly find items by name. I believe the errors with 8.1.5 have to do with the Item Button Template changes. In 8.1.5 they changed how the item button template works. Instead of being a virtual button that is inherited it is now a new widget type that can be created directly. I hope this addon gets fixed. I love it. It bugs out when trying to vendor an item that you "can sell to a vendor for full refund" or "trade to a party member" (or whatever it says, 2h countdown) E.g the comfirmation popup messes up the whole process. Is there a way around this (ignore them?) or can it be a new feature? Thank you very much for this addon, it's very helpful and I can see it being a core addon for me. After a week of using it, I'd like to share my thoughts. Sorry if some of these have been covered in early comments, I've gone through a few pages but honestly, not all of them. It wont sell epic (possibly all) BoP relics from Legion, I run the odd mythic for mount drops in Kara. Will it be possible to sell relics please? I sometimes run a lot of old raids in one go, with the quality of life changes, we can now get loot from the mailbox after a run. So I tend to have lots to sell at once. My screen resolution isn't the highest, so I can't actually press the sell button as it's off the screen! I can cancel the frame and vendor frame, then talk to the vendor again and press the sell button a 2nd time. Now it doesn't give me a list of what is to be sold, but I can now press the sell button. Can the frame have a scroll bar please? While looking down a large list of items, and having to double check the items in the bag, just to make sure I'm not doing something silly with an item is doable its a bit of a pain. Could we have a tooltip from the list please? Could we have the ilvl displayed next to the name on the list also please? The Cloak of Coordination/Shroud of Cooperation/Wrap of Unity, I've added it manually to my 5 accounts, so it's no big deal for me, but maybe for others. Could they be added by default to the white list please? Unfortunately I don't have a specific answer to this problem currently; all I can really suggest is to try toggling all the quick vendor settings off and back on again (if you haven't already) to see if that refreshes it into working correctly. If it's still happening, I just uploaded a new build with a couple extra tools that I whipped up to try and pinpoint the issue. (it's uploaded as a Beta build, so you'll have to check the file list here. With the update, you can use the command /evui qvcfg to dump the active configuration values to the chat frame, in case there's some sort of discrepancy between what's shown in the configuration interface and the actual values. You can also type /evui qvdebug to bring up a list of every item in your inventory and hopefully see why items aren't being picked up by quick vendor. Feel free to post/send a screenshot of the list showing the items that won't vendor and I'll see what I can figure out. Also, just to cover all bases, what level/class is your character? Thanks for coming back to me that quickly, LordGermbread. I have uploaded a screenshot of the issue. I am using the beta version you mentioned. The purples's in top portion of the list are Firelands loots. Hope this helps to narrow it down. Btw, I am using the German game client. Thank you. Playing on Alliance demon hunter lv 120. Alright, so it looks like the issue was due to localization, and the fact that EVUI doesn't have a German translation. I've made a fix for this issue, which will be up momentarily. Unfortunately, this only fixes the quick vendor filters for white gear and low level gear; other filters such as sub-optimal gear and unusable gear will still be problematic, as they still rely on translated strings that the client doesn't provide. That's a bummer for me. I will still keep using your addon because I like the double-sized window. Is it an option for you to go from "strings" to itemID's? They are not affected by translation. If you then click on German (in the top right corner) you will see the German translation for that item (Gesundheitsstein) but the itemID stays the same (5512). The translation issue is due to the item sub-types (Cloth, Plate, Sword, etc) being returned as a pre-translated string by the GetItemInfo API, which I then have to match in the EVUI strings. In general, this should only affect a portion of the quick-vendor and filtering features; specifically, the sub-optimal armor filters, usable armor/weapons, and low-level food/drink. Pretty much everything else should work normally. And translations are more than welcome :) You are correct, locale/enUS.lua is the file that would need to be translated to properly support the German client. Fortunately, no item names are involved ;) If you have any questions or need help, feel free to hit me up. name = "Recipe: Potion of Rising Death"
name2 = "Pattern: Embroidered Deep Sea Cloak"
link = "|cffffffff|Hitem:162427::::::::118:254::14::::|h[Pattern: Embroidered Deep Sea Cloak]|h|r"
link2 = "|cffffffff|Hitem:162427::::::::118:254::14::::|h[Pattern: Embroidered Deep Sea Cloak]|h|r"
__ = "Recipe: Potion of Rising Death"
link = "|cffffffff|Hitem:162131::::::::118:254::14::::|h[Recipe: Potion of Rising Death]|h|r"
(*temporary) = "attempt to call global 'ExtVendor_HasItemInBags' (a nil value)"
will be included in the quick-vendor feature. name = "Recipe: Potion of Bursting Blood"
name2 = "Recipe: Hardened Tempest Knuckles"
link = "|cffffffff|Hitem:162414::::::::110:70::14::::|h[Recipe: Hardened Tempest Knuckles]|h|r"
link2 = "|cffffffff|Hitem:162414::::::::110:70::14::::|h[Recipe: Hardened Tempest Knuckles]|h|r"
__ = "Recipe: Potion of Bursting Blood"
link = "|cffffffff|Hitem:162130::::::::110:70::14::::|h[Recipe: Potion of Bursting Blood]|h|r"
seems like there should be more text after tier but it cuts off. No worries, I already know what's wrong and have a fix incoming. In the meantime, turning on the "Hide Filtered" option in the filter menu should bypass the error. Hiya, Using the latest version I can't see anything on Zandalar vendors. 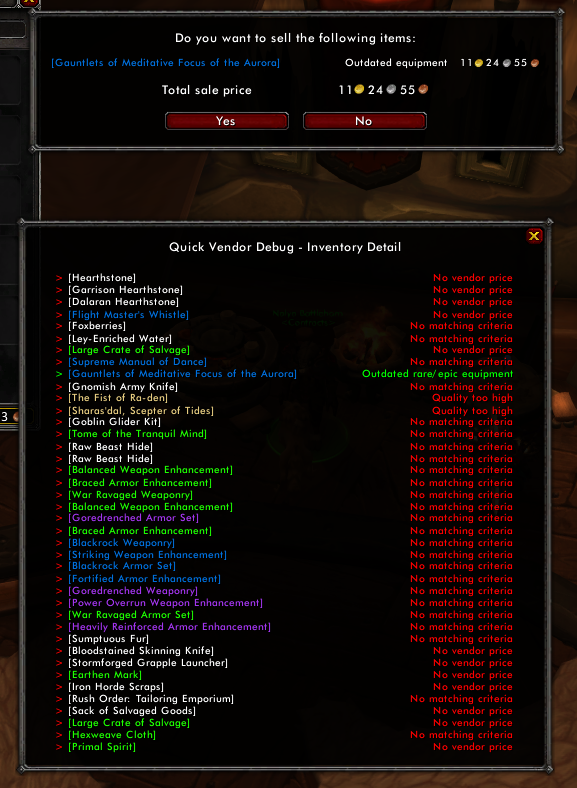 Disabling ExtVendorUI brings the vendor screens back. No error messages that I've noticed though, sorry! Happen to know the names of any of the vendors you experienced this with? Corcho - trade vendor inside the pyramid - was the first one, and I think the second one I tried was the reputation guy. Mind posting a list of other addons you might have running? Looks like there might be a conflict I need to address.